We recently received a comment related to bank failures from someone pointing out that in Germany, with a population of some 82 million, there are only about 5 banks (there are actually more - but let's stay with this line of thinking). The question was why does the US need that many banks? For one thing, banks in the US used to be quite profitable in the real estate boom days. They were also relatively easy to set up (particularly relative to Europe). The 2008 crisis however may have taken care of that, pushing the US closer to the German banking system, dominated by large national banks. The chart below shows the 2001 US banks sorted by total assets. It's a fairly continuous chart that may resemble other sectors with a relatively open competition. But the crisis changed all that. 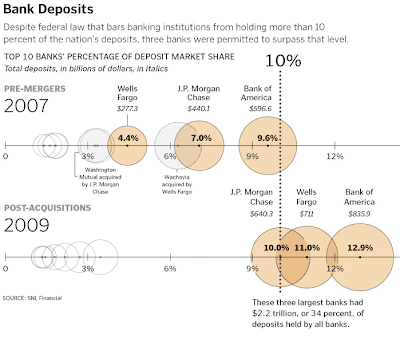 The 2009 picture looks quite different, showing a large gap between the fourth (Wells) and the fifth (PNC) largest bank (when comparing total assets). The ratio of assets between these two is over 4.5, showing that the top four banks are massively ahead of the rest of the industry. Large banks have tremendous advantages - from regulatory support to cheaper cost of funds and less reliance on deposits (ability to borrow interbank or in the capital markets). That advantage will continue propelling the larger banks ahead of the rest. Regulators' concerns are twofold: that consumers will wind up with fewer choices for services and that big banks will assume they always have the government's backing if things go wrong. That presumed guarantee means large companies could return to the risky behavior that led to the crisis if they figure federal officials will clean up their mess. One solution the regulators are proposing is to increase capital requirement on the larger banks. That [Obama administration's proposed] plan would impose higher capital standards on large institutions and empower the government to take over a wide range of troubled financial firms to wind down their businesses in an orderly way. But capital increases will negatively impact lending, as banks would rather focus on fee businesses that require little balance sheet usage. Reduced lending is the last thing this economy needs. But that seems to be the direction large banks are taking as they continue to probe for weaknesses in the wall of regulatory rules to come up with solutions that require less capital (whether it's rating agency shopping or TRS). The sale of the operations of failed Guaranty Bank in Texas on Friday to the U.S. division of a Spanish bank signals that foreign banks can succeed in the auctions for collapsed U.S. lenders. Banco Bilbao Vizcaya Argentaria SA on Friday became the first foreign company to buy a failed U.S. bank in this crisis; on Friday, federal regulators shut down Guaranty. Other foreign banks with a U.S. presence interested in gobbling up failing U.S. banks include French bank BNP Paribas SA through its San Francisco subsidiary, Bank of the West; Toronto-Dominion Bank, through its Portland, Maine, subsidiary, TD Bank; and Rabobank, the El Centro, Calif., subsidiary of Rabobank Group of Utrecht, Netherlands. With competition still in place in the US (for now), it's unlikely the US banking system will converge to look exactly like the one in Germany going forward (it's much harder for a new bank to make inroads in Germany). However the landscape, shocked by the financial crisis, will be changing rapidly, becoming almost unrecognizable in years to come.